England beat the USA 28-7 to secure bronze at the Singapore Sevens on Sunday. The USA took an early lead through Marcus Fasitupe Tupuola before England got on the board through Dan Norton. 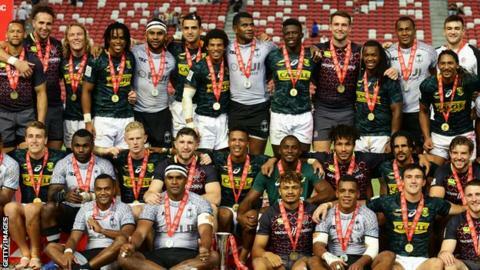 South Africa won the tournament, beating Fiji 20-19 in a thrilling final having trailed 19-0. England had earlier beaten Australia 31-19 in the quarter-finals, but lost their semi-final 26-12 to Fiji. "The growth that some of our young guys have shown is really encouraging," head of England Sevens Simon Amor said. "There have been some frustrating performances across the last couple of weeks but it's obviously pleasing to be back on the podium."